Who’s on Second? The Aftermath of the Logan Forsythe trade. After the news hit on Monday, that the Tampa Bay Rays had traded infield fixture and former team MVP Logan Forsythe to the Dodgers, for pitching prospect Jose De Leon. The overall consensus among Rays fan was “Why? Why trade an elite Second baseman and clubhouse leader (with 2 years of club control) for a talented but unproven prospect? It also raised questions about the aspirations of the front office to win in 2017. Undoubtedly, the offseason acquisitions of the Boston Red Sox make them the odds on favorites to win the A.L. East. Are the Rays considering 2017 a wash less than a month away from Spring Training? Or is this there another deal in the works? As far as the trade is concerned, only time will tell. Let’s not forget that Forsythe was once on the opposite side of an unpopular trade. Forsythe was acquired prior to the 2014 from the Padres for left handed reliever Alex Torres. Let’s explore some of the options for second base both within the organization and in free agency. Miller has played second base before with the Rays and Mariners, and the Rays have made it evident that they’re committed to Matt Duffy at Shortstop. Miller committed 14 errors in 105 games with the Rays last year at Shortstop. Miller committed only 3 errors in 3 seasons (37 games) with the Mariners at Second Base. Miller has made it clear that he’d prefer playing Shortstop. 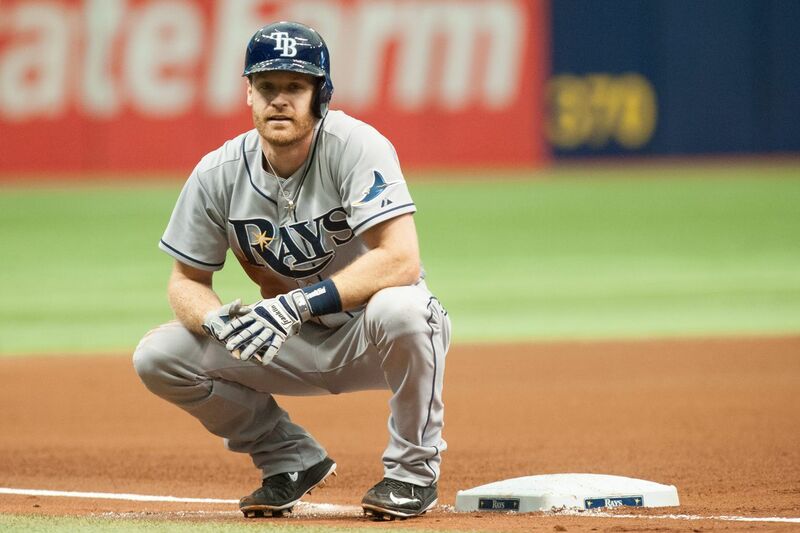 Would Miller consider being the Rays everyday Second baseman? Matt Duffy has played Second base on a very limited basis for the Giants (18 games in 2 seasons). If either player were moved to second, the Rays would most likely sign a free agent to play First base. Mike Napoli’s has been recently linked to the Rays. A year removed from Sleep Apnea surgery. The well rested Napoli posted a career high in both HR’s(34) and games played (150), while posting an OPS of .800 last season for the A.L. Champion Indians. There’s no doubt the Rays lineup would be vastly improved with Napoli’s 30 HR potential in the 5th slot behind Longoria and Miller. Another interesting free agent option is veteran journeyman slugger Chris Carter. Carter mashed 41 homers last year but struck out a dismal 206 times, leading all Major League hitters. Carter’s power is undeniable but his inability to consistently get on base (career OBP .314) leaves much to be desired. Carter and Souza Jr. in the same lineup could be a nightmare for Rays fans. While the potential of 50+ homers at the bottom of the Rays lineup seems tantalizing, the duo could easily combine for 300 strikeouts. Napoli is overall a better fit both offensively and defensively, signing him to a one year deal would come at at steeper price than it would for Carter, who is also a defensive liability. Other notable free agent 1B/DH; Brandon Moss, Pedro Alvarez, Billy Butler, Adam Lind, Logan Morrison. Adames made great strides last year in AA Montgomery, where he slashed an impressive .274/11/57 with 13 stolen bases and an OPS. of .804 for the Biscuits. Many believe Adames could be ready by the All-Star break. If so, signing a veteran such as Chase Utley to usher in Adames makes sense. Utley is at the twilight of his career and could fetch a fair price. The savvy veteran hit 14 homeruns and posted an OPS of .716 for the Dodgers in 2016. The 38 year old Utley would most likely platoon with Nick Franklin, but would provide invaluable experience and leadership for a relatively young Rays roster. Other notable free agent 2B: Aaron Hill, Kelley Johnson, Alexei Ramirez. Nick Franklin played very well in the second half of ’16. In 60 games Franklin posted an OPS of .771 while playing 6 different positions for the Rays. The Rays are hoping the former first round pick (27th overall in’09) of the Seattle Mariners is a late bloomer and will continue to produce in 2017. Speaking of late bloomers. There’s always Tim Beckham. Beckham’s poor play has made him the goat for many Rays fans. Beckham committed numerous base-running blunders and struggled both offensively and defensively in 2016. With the current lack of depth at middle infield, it’s very likely we will see more Beckham in 2017 in some capacity. Whether he will be able to turn his career around remains to be seen. Adames and Robertson far from ready, so signing a second baseman seems imperative if the Rays are to remain competitive this year in the A.L. East. Finally and perhaps more importantly. Who will bat lead-off now that Forsythe is gone? Kevin Kiermeier seems the most obvious choice, but has historically struggled in the leadoff spot. Kiermeier seemed to settle in nicely in the 2 hole last season. If the Rays elect to move Kiermeier back to the leadoff they’ll run the risk of a potential regression. Recently acquired Mallex Smith is a prototype lead-off hitter but along with Adames and Robertson will start the year in Durham. Corey Dickerson is 25 lbs thinner and has always had adequate speed. If Dickerson can show more consistency at the plate and improve his OBP., Dickerson could be a “Dark Horse” candidate. In Conclusion, the Rays have a lot to figure out these next couple of weeks as they head into Spring Training. I think it’s a safe to assume that the Rays aren’t done making deals yet. whether these moves will come via trade or free agency remains to be seen. The Tampa Bay Rays ready themselves for a two-game road set against Howie Kendrick — the Ray killer who boasts a 16-game hitting streak — and the Los Angeles Dodgers on Tuesday. Kendrick has owned Tampa Bay over 52 career games, batting .359 with four homers and 24 RBI. More impressive, he sports a .377 average in the month of July — 26-66 with three homers and nine RBI during his streak. Kendrick was seemingly unstoppable when he and the Dodgers battled the Rays in May, going 5-9 with an extra base hit and two runs batted in. The Dodgers currently lay claim to top wild-card spot in the National League, while the Rays are one game ahead of Minnesota for the bottom spot in the American League after dropping three straight in Oakland over the weekend — all by one run. On the plus side, Corey Dickerson is 11-25 with four RBI during a six-game hitting streak. Kevin Cash will throw Chris Archer (5-13, 4.60 ERA) and Matt Moore (6-7, 4.31 ERA) over the span of the next two days. Dave Roberts will respond with Bud Norris (5-9, 4.56 ERA) and Brandon McCarthy (2-0, 1.21 ERA). Archer threw six strong innings against the Rockies on Wednesday, scattering four hits while fanning 11 and walking two en route to his first win since the middle of June. Archer has been disappointing this season, however, he tossed an excellent outing in Colorado. And while his ERA and W/L record are less than stellar, the righty has struck out 147 batters — best in the AL. Archer’s biggest struggle has been with fastball command; his 51 walks speak to that. In short, the free passes have been a major factor in his struggles this. Moore held Oakland to three runs on four hits over seven innings Thursday, while fanning six and walking two in the Rays’ lone win of that series. The southpaw has now collected five consecutive quality starts, although he’s just 3-2 with a not-so-impressive 2-to-1 K/BB over that span. With a .167 BABIP over the last 14 days, t’s safe to say the luck dragons have been on Moore’s side. If the trade rumors swirling around MattyMoe are true, this could be his last start in a Rays uniform. — Logan Morrison (wrist) should return to the lineup after missing the last six games. — Logan Forsythe is 9-28 with a homer and six RBI during a six-game hitting streak. — Corey Seager is 16-40 during an eight-game hitting streak, raising his average to .306. Looking Backward While Moving Forward: Casali’s walk off RBI single, lifts Rays past Jays. (Photo Credit: Anthony Ateek/X-Rays Spex). Chris Archer didn’t have his best stuff Saturday night versus Toronto. Despite walking 4 and throwing 100 pitches in only six innings of work, Archer allowed only one hit, a 2-run home run off the bat of Joey Bautista which hugged the left field foul pole in the bottom of the third. Archer had command issues early on, but settled down after Bautista’s homer and retired the next six batters he faced. The Rays responded in the bottom half of the third, thanks to the “red hot” Logan Forsythe’s RBI single which scored Kevin Kiermaier from second. Kiermaier singled, then stole second (3), prior to Forsythe’s base knock. After 2 horrid at bats vs. J.A. Happ, Evan Longoria homered over the wall in right-center to tie things up at 2-2 in the bottom of the 6th. Longoria was 3 for his last 27, prior to hitting his 4th home run of the season. Kevin Pillar homered off Rays reliever Enny Romero in the top of the 7th, giving the Blue Jays a 3-2 lead. Blue Jays manager John Gibbons elected to keep J.A. Happ in the game for the seventh, due to the recent ineptitude of their bullpen. Logan Forsythe would make him pay for that mistake. Forsythe crushed Happ’s 1-1 2 out offering over the centerfield wall to tie the game. Forsythe has been on a torrid rampage over the past two weeks, batting a scorching .405( 17 for 42), hitting 7 doubles, scoring 9 runs and swiping 3 bags in that span. Forsythe has been an on base machine of late and seems to be settling nicely into the leadoff spot. Pinch hitter Brad Miller hustled out and infield single, barely beating first baseman Justin Smoak on a sharply hit grounder to first. Kevin Kiermaier followed with a double to the right field gap, advancing Miller to third. Curt Casali, who’d been struggling offensively, (.133 over his last 15 games) lined Bret Cecil’s 3-1 offering over Troy Tulowitzki head into left field scoring Miller for the walk off victory. The walk-off win ended the Rays 2 game skid and tied the season series versus the Toronto Blue Jays 3-3. The “Rubber Match” is tomorrow afternoon at the Trop. First pitch is at 1:10. Jake Odorizzi will take the mound for Tampa Bay in the series finale, opposite of Marcus Stroman. Odorizzi (0-1, 3.58 ERA) Odorizzi has shown to be adept at preventing the big inning and posses the ability to battle when he doesn’t have his best stuff, which he did Tuesday while holding the Orioles to one run in five innings. Now, if he can get ahead of batters and again become the efficient pitcher he was in 2015. Stroman (3-0, 4.37 ERA) has thrown at least six innings in seven of his last eight starts (dating back to 2015). He is 2-1 with a 4.74 ERA in three career starts against Tampa Bay, and this is the second time this year he will be matched up against them. You can read about the pitching matchup in our series preview. ― Rays SS Tim Beckham made a couple of good defensive plays at SS, including a diving grab robbing Jose Bautista of what could have been an RBI single. Beckham also hit his first double of the season in the fifth inning. ―Steven Souza Jr. started at DH on Saturday and hit his 3rd double of the year following Longo’s homer in the sixth. Souza also struck out 3 times. ―Kevin Kiermaier committed his first error of the season in the first inning of Saturdays game. KK’s only committed 7 errors his whole career. ― Brandon Guyer will make his third consecutive start today, this time in LF and in lieu of the slumping Desmond Jennings. In the midst of injuries, both on the field and in the stands, the Tampa Bay Rays dropped their third consecutive game, this time by a score of 1-0 against Chris Sale and the White Sox. Jake Odorizzi got the start for Tampa Bay and was able to work through some early trouble from the first inning through the fourth when he allowed the majority of his base runners, and threw only 2-of-8 first pitch strikes. Yet Jake was able to limit the ChiSox offensive chances by coaxing a key double play in the second and a fielder’s choice in the fourth. Something clicked for the Rays hurler from then on, and for parts of the next three frames Odorizzi went into lockdown mode, retiring the last ten batters he faced ― making for an exciting pitchers duel through the front seven. Unfortunately for the Rays, one of the jams by Odorizzi resulted in a collision in the field and injuries to a pair of critical every day players: Logan Forsythe and Kevin Kiermaier. With two outs and runners on the corners, Odorizzi coaxed a popper out of Avisail Garcia into shallow right-field. Both fielders ran toward the play with a full head of steam, culminating in a scary collision between Forsythe and Kiermaier. Although Logan made an excellent inning ending catch, both had to leave the game. Forsythe suffered a bruised left hip and lower left leg, while Kiermaier suffered a head contusion and is being evaluated over the next 24-hours. If there is a positive outcome to the collision, it’s that Kiermaier has been diagnosed with a contusion, not a concussion. A reevaluation of both players is expected prior to Saturday’s game, at which point a roster move would also be announced should either player be added to the 15-day DL. The collision also signaled the end of Odorizzi’s start after seven scoreless frames. For his part, Odorizzi kept the score tied at 0 and the Rays with a chance of beating one of the game’s best pitchers. His final line: 7 IP/4 H/0 R/1 BB/6 K on 94 pitches (59 strikes). Another scary moment occured in the bottom of the seventh after Stephen Souza Jr. fouled off a pitch that found a four-inch opening in the screen behind home plate. The foul ball hit a 63 year-old fan in the eye, resulting in a 12-minute game delay. By the start of the next inning, EMTs carried the fan off the field on a stretcher; she was admitted to Bayfront Medical Center in St. Petersburg. Clearly shaken, Souza went into the stands to speak with the fan after his at-bat. There has not been much of an update on the fan except that she is in stable condition at Bayfront. That at-bat also ended to the only threat the Rays would mount against Chris Sale. Up to that point, Sale had given up just a one-out single to Desmond Jennings in the second before retiring the next 14 batters. With two outs, Steve Pearce lashed a base hit into the left-field corner. Jennings followed and reached on an error. But with his head clearly not in the game, after the incident in the stands, Souza went down swinging one pitch after the incident. Xavier Cedeno followed Odorizzi with a perfect eighth, collecting a pair of strikeouts. After Cedeno, Alex Colome came in to work the top of the ninth. Jimmy Rollins welcomed Colome with a looper of a fly-ball to Jennings in left. Despite a hard charge toward the play, Jennings trapped the ball after making a terrific sliding effort. Colome coaxed another fly-ball, this time to right-center, which almost resulted in another collision between Brandon Guyer and Corey Dickerson (who entered when Kiermaier left). Dickerson made the catch, but his soft-toss back in allowed Rollins to aggressively tag from first and get into second safely. A sharp single by Melky Cabrera, just past the dive of Steve Pearce at first, allowed Rollins to score easily, giving Chicago an unrelinquishabpe one run advantage. Finally, Guyer took a Sale fastball for a ride into deep left-field in the bottom of the ninth, giving the Rays a faint glimmer of hope. Unfortunately the ball fell just short, and into Cabrera’s glove. In the end, Tampa Bay fell 1-0 for the team’s third consecutive loss. The three-game set will continue on Saturday when Erasmo Ramirez makes his first start of the season, opposite of LHP John Danks, who was originally scheduled to throw Friday. The team wanted to keep Sale on regular rest after a rain-out last Sunday. You can read about the pitching matchup in our series preview, and I’ll post the starting lineup upon availability. — Neither Forsythe nor Kiermaier are in Saturday’s lineup. However, both are on the lineup card, so it would appear neither player will be added to the 15-day DL. — According to JT Morgan (DRaysBay) the Rays went 2/21 of balls hit into the field, good for a .095 BABIP. — The opening, that allowed the foul ball by Souza to pass into the stands, has been closed. — After their first 10 games, Rays pitchers have the most strikeouts (95) and fewest walks (23) in club history. — Using the same rationale some use with the Rays or A’s, perhaps the Yankees should be moved 20 minutes away to Brooklyn, or across the river to New Jersey. Then again, MLB should just jump the shark and move ’em to Montreal! Matt Moore put together the best start of any Tampa Bay Rays hurler on Tuesday night, posting seven strong innings while allowing just one run. Meanwhile, for the third time in a week, the Rays rallied in the eighth inning to win, this time beating Cleveland 5-1. Moore got the start for Tampa Bay and allowed a run on five scattered hits. The southpaw fanned five, including the side in the first inning. Over the course of the first three innings, Moore gave up just two singles, yet more importantly Moore only incurred just one self inflicted wound. With the exception of Francisco Lindor and Yan Gomes in the fourth inning (more on that below), nary an opposing batter made it past first base. Moore sequenced his pitches well, and even though he wasn’t throwing upper 90s heat, he impressively kept the wolves at bay by dropping in a well located changeup (14 overall, 10 strikes, 71.4% K%). My personal favorite at-bat came with two outs in the top of the third. With Jason Kipnis at the plate, Moore dotted the outside corner of the zone with a 93 mph fastball. It was a borderline/below the zone pitch, yet Hank Conger made sure was called a strike by quickly shifting his glove upward. That particular at-bat resulted in a fly-ball out four pitches later. The only real mistake made by Moore came in the fourth inning, when Lindor hammered an 0-1 changeup over the center-field wall for the go ahead lead. Moore got some help to get through that frame without any further damage. After Mike Napoli singled through the shift into left, Carlos Santana just missed a homer to left which Desmond Jennings caught at the wall. Napoli, who isn’t the most fleet of foot, attempted to tag up from first, but Jennings wasn’t having any of it. The left-fielder rattled off a perfect throw from the warning track to Logan Forsythe at second. The throw was perfect and Forsythe quickly put down the tag for a 7-4 double play ― a play that was upheld by replay. The play also proved important, as Gomes doubled to deep center three pitches later. Instead of unraveling, Moore kept it together and coaxed a grounder to second to end the threat and the inning. Matty Moe ultimately posted an impressive 7 IP/5 H/1 ER/1 BB/5 K line on 104 pitches (65 strikes). Tampa Bay rallied in the seventh to tie the game with two outs. Corey Dickerson got the rally started by lining a ball to left over the head of Jose Ramirez which the designated hitter turned into a double. Jennings followed by blooping an RBI single to left-center, evening the game at one apiece. The Rays were able to take a commanding lead an inning later. Indians’ hurler Corey Kluber allowed just three hits entering the eighth inning, that is to say he pitched well. However, the Rays finally got to him in that frame, and it all began with a one out walk by The Outlaw. Well aware of the scouting report ― that Kluber allowed 16 stolen bases in 2015 ― Kiermaier stole second as Conger went down swinging (another play upheld by video replay). Forsythe came to the plate, but he quickly fell behind 0-2. However, he was able to battle back to work the count full before Kluber let loose with a misplaced fastball that Forsythe hammered over the left-center wall for two-run lead. The homer chased the 2014 Cy Young Award winner from the game, spoiling an otherwise excellent start. Cody Allen entered the game in relief and walked Logan Morrison before allowing the second homer of the inning, this time a two-run shot to left by Evan Longoria, capping the four-run rally. Tampa Bay has now homered in 21 consecutive games (extending back to 9/20/15). The rally made a winner out of Xavier Cedeno, who worked a 1-2-3 eighth inning in relief of Moore. Alex Colome finished up with a perfect ninth. The Rays will look to get back to .500 on Wednesday when Drew Smyly takes the mound opposite of Carlos Carrasco. Smyly’s second start of the season was pushed back to Wednesday night after the winter weather postponement in Baltimore on Saturday. As for Carrasco, he will be hard pressed Wednesday night to match his last start against the Rays on July 1, when he carried a no-hit bid two outs into the ninth. You can read about the pitching matchup in our series preview. — Alex Cobb (Tommy John Surgery) advanced to throwing 20 fastballs halfway up a mound Tuesday before the game. “I think from here on out things will start speeding up,” said Cobb, who is expected to return by late July. Chase Whitley (Tommy John Surgery) also threw 20 fastballs halfway up the mound. He too is expected to return before season’s end.